Their AF1s release alongside CLOT’s AJ13, Pharrell’s Crazy BYW X, and much more. In last week’s selection of footwear drops we saw the highly-anticipated debut of the Nike Air Fear of God 1. Alongside the Jerry Lorenzo-designed drop we also welcomed another YEEZY BOOST 350 V2 “Semi-Frozen Yellow” restock in addition to the aggressive A-COLD-WALL* x Nike Zoom Vomero +5. As we get closer and closer to the end of 2018, we’ve seen footwear powerhouses save their best for last and this week continues that notion. Our weekly drop continues as we showcase releases to look for from your favorite brands, curating the most hyped releases and strongest silhouette/colorway combinations that should not be missed. Take a look at the list below and let us know what launches you’re looking forward to. Last week, we saw the Nike SB Dunk Low “Purple Lobster” release at CONCEPTS’ Cambridge, MA and NYC locations. This week, we’ll see the latest sea-inspired chapter from CONCEPTS and Nike SB hit Nike SNKRS. The highly-anticipated drop includes extra sets of laces, rubber bands and is housed inside a special packaging. Virgil Abloh‘s Off-White™ continues its Nike partnership thanks to another release to close out the year. This time around, the Swoosh’s iconic Air Force 1 Low is dipped in two new colorway choices as “Black” and “Volt” follow THE TEN’s original release in white. Over the past few years we’ve seen some of LeBron James‘ earlier signature sneakers make unexpected returns. This week, his third sneaker – the Nike Zoom LeBron 3 – makes a comeback in its “Metallic Gold” iteration. adidas Originals‘ latest ’90s-inspired silhouette welcomes a breathable mesh upper met with suede and leather overlays throughout. The Three Stripes branding appears in a blue, white and green color scheme, which is found again at the heel counter as an embroidered Asterisk logo. Lastly, the bright and bold theme continues at the tongue, insoles and semi-translucent outsole. In our previous footwear drops installment, we shed light on the A-COLD-WALL* x Nike Zoom Vomero +5. And now this week, Samuel Ross’ fashion house will release two collaborative Air Force 1 Lows. Not only does this come after the aforementioned runners, but it also presents a sequel to the highly-limited Air Force 1 High release from last year. CLOT is the latest to join forces with the mighty Jordan Brand, using the Air Jordan 13 Low as its canvas. CLOT takes inspiration from the Terracotta Warriors – an army of life-sized sculptures – with clay-like colors on its suede upper. Following the AJ10 “Air Huarache Light” and AJ3 “Air Trainer 1,” the Air Jordan 8 takes some design cues from the Nike Air Raid II. The ’90s model was initially designed to endure harsh outdoor playing environments with a special mix of colors as a way to celebrate world peace. 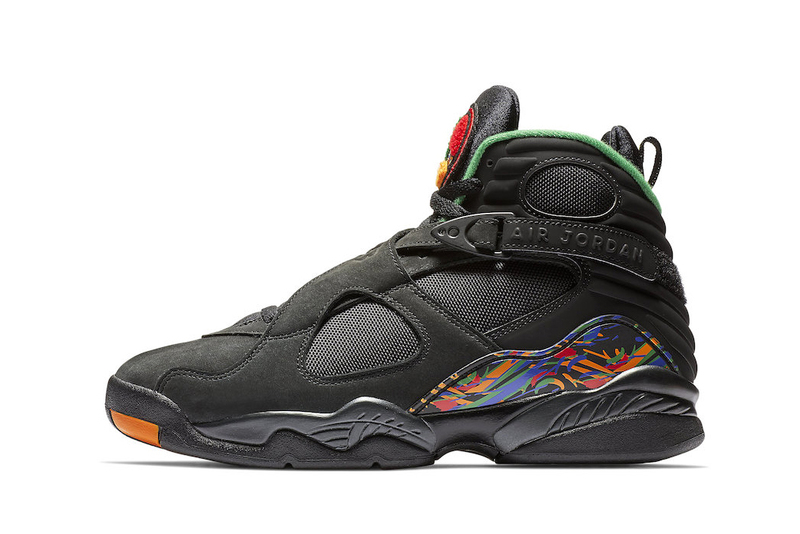 That same theme is expressed on this AJ8 as its black base is joined by orange, green, blue, purple and red at its heel, fuzzy tongue logo and inner lining. This colorful adidas Crazy BYW X is finally hitting shelves. Since we first saw Pharell debut the pair a few months back, fans of the Three Stripes have been patiently waiting to see if it would ever be made available to the public. Its black Primeknit upper is met by a selection of colors, from yellow on its piping and outsole, to blue and red on its lacing eyelets. The collaborative design is finalized with “Empathy” appearing down the left sneaker and “Gratitude” down the right. adidas Originals‘ Dragon Ball Z collaboration continues with the EQT Support ADV Mid Primeknit. Dressed in “Collegiate Green/Core Black-Bold Gold,” its makeup pays homage to the dragon Shenron from the world-renowned anime. Aleali May reconnects with Jordan Brand for a new Air Jordan 1 and Air Jordan 10. In collaboration with WNBA superstar Maya Moore, the two sneakers share premium suede on each respective upper as the color blocking gains inspiration from Moore’s favorite jerseys throughout her career. Lastly, the Air Jordan 1 features a removable faux fur tongue as a nod to Aleali’s connection and impact on fashion. New menswear collections from heavyweight designers. Apple, Amazon and now Google are looking to expand. Practices that spurred his ‘Superflat’ practice. Win both blue and pink versions.